We present a reduction of a large-scale network model of visual cortex developed by McLaughlin, Shapley, Shelley, and Wielaard. The reduction is from many integrate-and-fire neurons to a spatially coarse-grained system for firing rates of neuronal subpopulations. It accounts explicitly for spatially varying architecture, ordered cortical maps (such as orientation preference) that vary regularly across the cortical layer, and disordered cortical maps (such as spatial phase preference or stochastic input conductances) that may vary widely from cortical neuron to cortical neuron. The result of the reduction is a set of nonlinear spatiotemporal integral equations for “phase-averaged” firing rates of neuronal subpopulations across the model cortex, derived asymptotically from the full model without the addition of any extra phenomological constants. 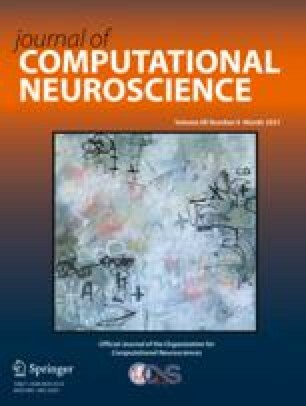 This reduced system is used to study the response of the model to drifting grating stimuli—where it is shown to be useful for numerical investigations that reproduce, at far less computational cost, the salient features of the point-neuron network and for analytical investigations that unveil cortical mechanisms behind the responses observed in the simulations of the large-scale computational model. For example, the reduced equations clearly show (1) phase averaging as the source of the time-invariance of cortico-cortical conductances, (2) the mechanisms in the model for higher firing rates and better orientation selectivity of simple cells which are near pinwheel centers, (3) the effects of the length-scales of cortico-cortical coupling, and (4) the role of noise in improving the contrast invariance of orientation selectivity.